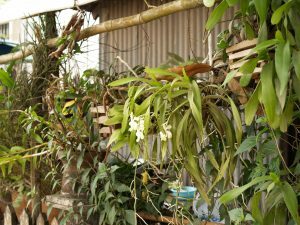 We have noticed that several of our orchids are flowering at different times of the year in 2019 compared to previous years. This may be linked to our exceptionally warm summer last year or the very mild winter we have experienced so far. 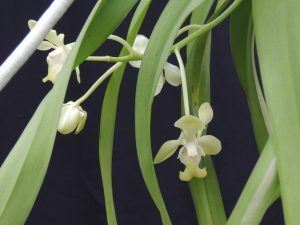 Vanda denisoniana usually flowers around Easter but has just opened its first ever flowers in Janurary. The plants were grown in our school laboratory from seed collected from cultivated plants in Luang Prabang, Laos, in 2006. We found plants growing in a back street in this wonderful city (a world heritage site) and were struck by the beauty of these subtle flowers. The parent plant in Luang Prabang. 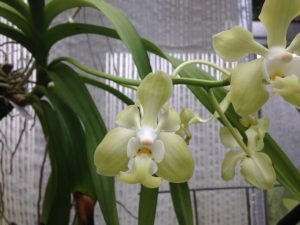 The plants had ripe seed and a small quantity collected was sown back at school in 2007. The majority of the seedlings were returned to Laos when we visited and helped Souk and Eddie set up their laboratory in Paksong in 2011 but a few were kept to grow a permanent seed source at Writhlington. The plants have grown well but slowly and we were sure that they had reached flowering size and so have been moving them around in our Warm Asia section to find the perfect spot. 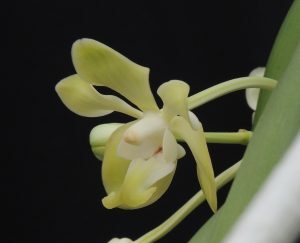 The plant living near the door on the south side of the greenhouse responded by throwing out its first spike this spring and the flowers opened this week. We grow the plants in baskets that allow their extensive roots to hang freely in the air. We spray plants daily throughout the year. The species is found in primary forest from 450-1200m from Southern China, Burma, Thailand, Vietnam and Laos. It is probable that the plants in Luang Prabang originate from the still heavily forested North Eastern Laos. The flowers have the added benefit of being beautifully fragrant in the evening. More seedlings will hopefully be available from these plants from about 2019.